Edraw mind map is a great choice for activity planning with a collection of powerful tools to perfect planning. It is a collection of amazing possibilities. Activities can help people relax, enrich people's life and engage participants through interaction. 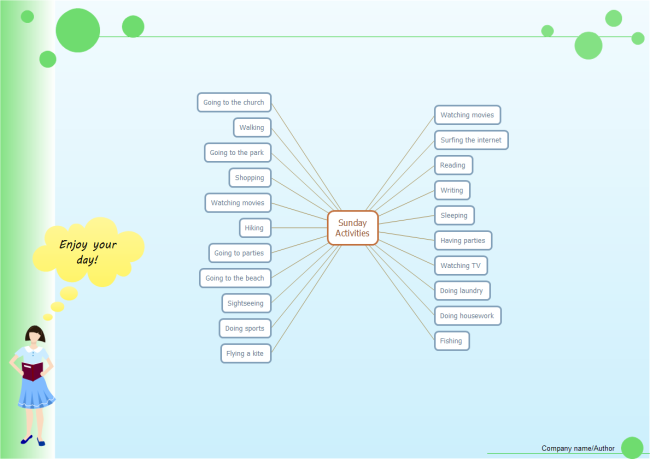 Mind maps can be applied to plan a series of activities as well as a particular activity. Edraw mind map aims to let every user have the best possible experience in drawing and planning. In this respect, examples speak louder than words. 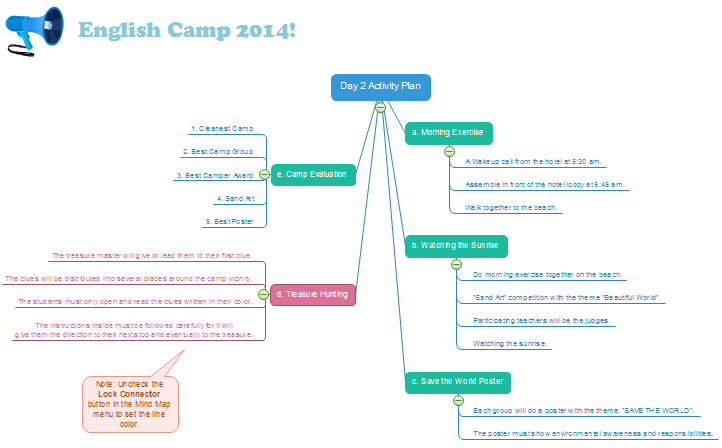 Please take a look at our English Camp Activity Plan firstly. A mind map can not only show the sequence of major activities but also distinguish them in different colors. Furthermore, detailed rules for activities can be illustrated, too. In the example, a wide range of possible activities for Sunday are listed. And that is just for starters. You can make the list go on and on by adding more activities, inserting descriptions or inserting symbols. With this mind map, you will find that there are so many choices to make your Sunday colorful and you are more likely to do some outside activities rather than just staying home surfing Internet. When it comes to holding a specific activity, planners are required to lay out the basic relevant information. For example, to plan a barbecue, basic components like time, place, participants, budget and the host's contact information should be included. These are also needed when informing participants. Compared to linear text, the strength of mind map lies in the ease of understanding in an instant for its feature of organized visualization. To make your plan catchier and attract more participants, you can make the mind map more beautiful by inserting symbols. To be clear about the sequence, click Numbering on the Mind Map tab. To change distance between shapes, use Distance function on the Mind Map menu to increase/decrease horizontal/vertical distance. To send your plan to people who do not have Edraw, export in into PDF format or turn it into slideshows.